Boy, have I tried a lot of falafel recipes. I’ve pan-fried and baked — I don’t deep-fry anymore after nearly setting the kitchen on fire once. I’ve bought special tools from Israel for scooping the disks so the mixture won’t disintegrate. I’ve tried adding spinach for color, baking soda for leavening, and all sorts of inauthentic spices. My solution is not how it’s made in Middle Eastern restaurants and carts, where they soak raw chickpeas for 12-24 hours, grind them with the other ingredients, then deep-fry the balls. Mine are made from canned chickpeas and are baked with a minimum of spray oil. 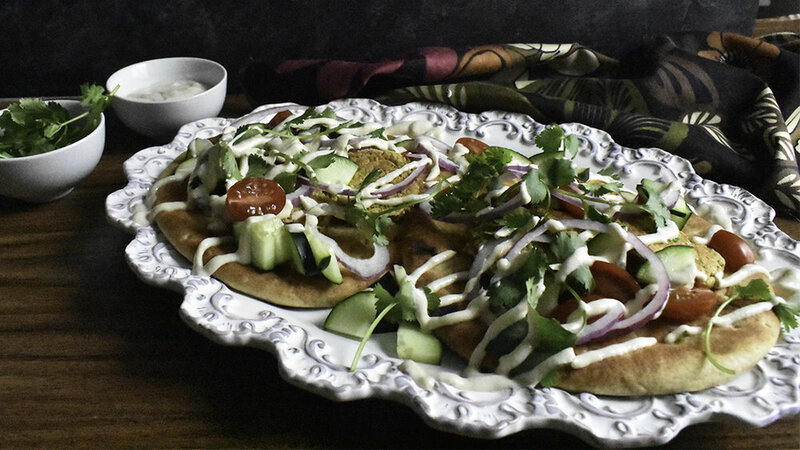 But they hold together without fail, are simply and well spiced, have a lot fewer calories and fat then traditional falafel, and go well with pita, vegetables, and tahini sauce. I’m sticking with these. Preheat the oven to 400F. Line two baking sheets with parchment paper. Lightly spray the papers with spray-oil. Pulse all the ingredients together in a food processor until everything is minced but not reduced to a smooth spread. Stop and scrape down the sides if necessary. Add another Tablespoon of water if the mixture doesn’t adhere. Scoop the mixture into tightly packed 2-Tablespoon balls (a cookie scoop works well for this). Put the balls on the parchment paper, then flatten them into thick, tight patties. Spray the tops of the falafel with spray-oil. Bake for 15 minutes, until the bottoms are golden. Then flip them and bake for 10-15 minutes more, until the other sides are golden.